The 22-year-old won gold in the women's giant slalom Thursday. And she's widely expected to snag even more medals. American skier Mikaela Shiffrin finally got to compete in her first event of the 2018 Winter Olympics on Thursday. And it was definitely worth the wait. 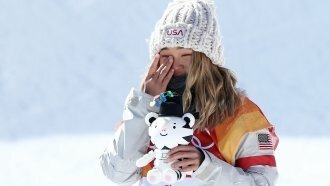 After days of weather delays — thanks to the particularly windy conditions in South Korea — the 22-year-old won gold in the women's giant slalom. And she's widely expected to snag even more medals. Shiffrin told reporters, "It's been a mental strain the last couple of days, thinking we were going to race and then not racing. Now we got the ball rolling." This is Shiffrin's second Olympic gold medal. Her first was from the women's slalom during the 2014 Games in Sochi. She'll compete in that event in Pyeongchang on Friday.